Tamil Veeram is touted to be one of the biggest blockbusters of actor Thala Ajith. The masala-entertainer, directed by Siva, tells the story of a person who lives in a village with his four brothers and his love and sacrifices for the brothers. Thala Ajith portrayed the main lead in Veeram while Bala, Vidharth, Suhail and Munish portrayed the brothers' role of the Tamil superstar. And now, Veeram is all set to be remade in Bollywood. Reportedly, Sajid Nadiadwala is all set to remake Veeram in Bollywood with superstar Akshay Kumar titled LOL - Land Of Lungi. 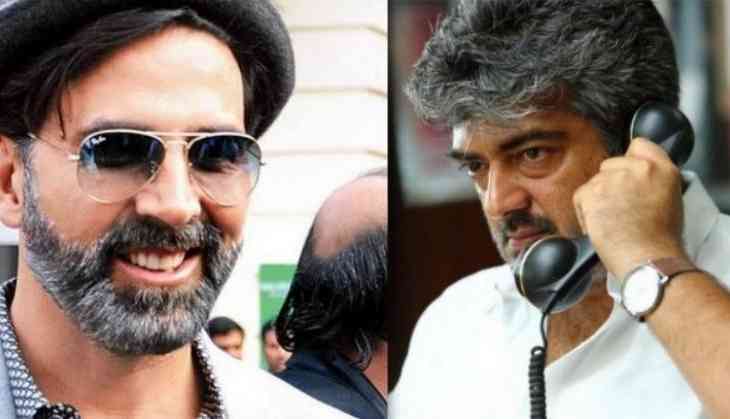 The Bollywood Khiladi, who is basking in the success of his recent release Toilet Ek Prem Katha, will be playing Thala Ajith's role in the film. The makers are planning to retain Tamannaah Bhatia, who essayed the female lead in Veeram in its Bollywood remake as well. Screen writer-turned-director Farhad has been finalised as the director of Land Of Lungi. Interestingly, Land Of Lungi will also marks the second collaboration of Akshay Kumar-Tamannaah-Farhad duo after the 2014 film It's Entertainment. It remains to be seen how Land Of Lungi will perform at the Bollywood Box Office as Pawan Kalyan's Katamarayudu, the Telugu remake of Veeram, which had released in March this year turned out to be a disaster at the Box Office.